GoPro has finally fully revealed its Fusion 360-degree 5.2K spherical camera, filling in all the gaps which were left when we got a first look at the device back in June. This is a fully mountable and waterproof camera (to a depth of 5m) capable of capturing 5.2K resolution video at 30fps, or 3K content at 60fps (or indeed 18MP spherical photos). GoPro also boasts that the Fusion benefits from gimbal-like stabilization trickery which helps ensure that your footage is nice and smooth. As well as shooting 360-degree footage for VR, you can also use the software’s ‘OverCapture’ mode to create traditional (2D) videos from the footage, with the ability to dynamically change the perspective of the video (because you have content shot from all angles by the 360-degree camera, of course). In other words, you can pull off videos like the examples shown in the clip below. 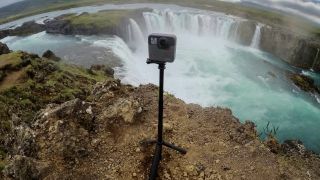 On top of 360-degree footage, you also get directional 360-degree audio thanks to an array of microphones. Fusion supports Wi-Fi and Bluetooth in terms of connectivity, offers voice control in 10 different languages, and comes with a Fusion Grip Mount. It should also play nice with most other GoPro mounts. The GoPro Fusion will this November starting at $699/AU$1,000 (about £520).